It was hoped that Shanita Namuyibwa aka Bad Black would get bail today but it looks like all efforts have hit a dead end as she has been taken back to Luzira prison where she has been for close to a month now. Bad Black and three others presented land titles to court which have to be verified with the lands office to ascertain if they are authentic. Court will decide her fate on Wednesday. Meanwhile, the international media has picked interest in the case courtesy of Greenhalgh a 53 year old who is a father of two and never wanted the wife to know about this whole saga. The UK's Mail Online had Bad Black and Greenhalgh as one of it's stories. Greenhalgh is not bothered about the lost money but what disturbed him most was Bad Black feasting on his money with local 'boys' who in the end turned around and referred to him as a fool. 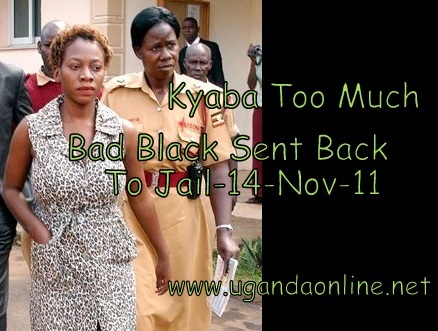 Bad Black has made news in the past weeks for various reasons. She was arrested on allegations of embezzling funds that belonged to her lover and business associate Greenhalgh. The latest information is that Bad Black is pregnant for Greenhalgh who has been taking care of her two kids from different white men.